We export High Temperature cables to all over the World. Product Specification We hold expertise in offering supreme quality Trailing Rubber Cables . These cables are widely demanded by our customers for their excellent conductivity and durability. The cables are demanded by various known companies like, ABB, JSW ISPAT as our Trailing Rubber Cables is approved by the IS : 9968 (Pt-1)/88 ISI standards. Quality silicon rubber is used for insulation to protect the cables from water and ensure high tensile strength. BHUWAL CABLES Rubber insulation in Rubber Trailing Cables holds its vital role in specific application where high flexibility and comparatively high temperature is required. 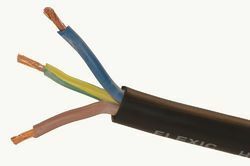 Rubber insulation also permits simple splices and terminations. Sythetic rubber such as butyle rubber, Etnylene Propylene rubber, Poly Chloroprene rubber, Chlorosulphunated polyethylene rubber have better heat resistance, oil resistance and resistance against influence as compared to natural rubber. Out of all the synthetic rubber, silicon rubber has excellent die-electric characteristics. It is possible to operate silicon rubber insulated cables at ambient temperature of upto 180oC continuously. The polychloroprene rubber, chlorosulphonatated, nitrille sheating are formulated against high abrasion, oil, weather and fire resistance properties. EPR insulation with CSP sheathing can withstand high ambient condition having long durable ageing properties.